Gaggan, No.3 of Asia's Best Restaurants 2014- which is probably the highest position indian restaurant in the world. Located in a pretty restored vintage villa, Gaggan served molecule Indian cuisine with an ultra-modern twist. The interior decoration doesn't looks like an Indian restaurant at all- it is elegant and high-end. 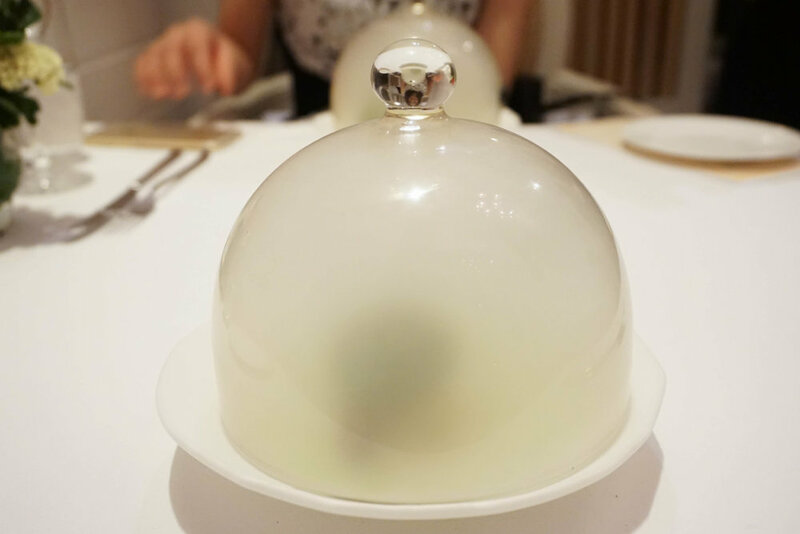 Gaggan only provides dinner set menu(s), there are basically 3 kinds of sets to choose from. 1,800 THB for 9 courses, 2,800 THB for 11 courses and 4,000 for 14 courses. Basically mango sorbet with some fresh mango and fresh ikura-nothing too much special about this course. But the presenting is quite cute, doesn't seems like Indian at all. The yogurt explosion looks like a jelly egg, with egg flavor inside but was not made of eggs. Eat the thing as a whole and feel the egg flavor filling bomb in your mouth. The one in the middle was green apple chocolate with a spice filling- very interesting combination of sweet and spice. Edible Plastic Spiced nuts- its name tells everything. The 'plastic' was the same as the wrappings of some candies, inside was crashed pistachios and peanuts with spices. Very creative nibbling and the taste was not bad at all! Potato 2-some crispy and liquid(left up) was made of deep-fried noodles with a citrus jelly on the top, very nice combination of the deep-fried noodles and the jelly brought a touch of refreshment. Bengali mustard and noori pakoda (left down) tastes like cheese but it is good.Papadam and tomato chutney on the right was deep-fried rice crispy with a touch of yellow curry on the top. Then comes Keema po(left), which is a mini lamb burger. As i don't eat meat, the chef changed mine to curry potato burger. I don't know the taste of the lamb burger but mine is quite good, the curry flavor is strong and feel like real 'Indian' this time (compare to the previous dishes). Made of hot souffle of 4 kinds of cheese, it is smells and tastes really 'chessy',topped with a little bit green chily oil, the flavor becomes more refresh and balanced. With some crispy rice cereals underneath the cheese, the texture was great but we feel it is kind of cheap to use the corn flakes you can find anywhere. The little cute sandwich was made of foie gras mousse and onion water baguette, which is really light and fluffy, the texture was just like plastic, unbelievable! There was a subtle hint of onion chutney and hazelnut candy. The overall taste of the sandwich was really good- creamy, smooth foie gras with the unbelievable airy 'buns'. The stone was really HEAVY stone and i cannot hold it in one hand. A soup made of summer vegetables ( asparagus, morels, mushrooms and artichoke) with 62 degree egg yolk and truffle chili air. The egg yolk was not running but it was transparent with a jelly texture, the center of the yolk was more like liquid - really lovely egg yolk. The soup was milky, not that creamy and greasy because no starch was used in the soup. The touch of truffle chili oil was lovely, which brought a twist of Indian to the dish. The mashed potato actually tastes the same as the one inside my burger, with a strong flavor of curry. It was smooth and creamy. While the powder outside reminds me of the 'ash' course at Narisawa, and it was also spicy, but much more spicy than the one i had in Narisawa. This charcoal potato was really hot and we drunk a lot of water to rush out the spice...But it was really good. The prawn was big in size and very flavorful with a curry twist, while the green indusion nicely balanced the entire piece. Angry Bird-Slow cooked country Thai native chicken in a spiced Chettinad style curry served with rice idiyappam(rice noodles South Indian style) and steamed rice. While mine was actually fish because the chef changed the dish for me due to my diet restriction. My curry was more like 'Thai' yellow curry, while the fish itself was very tender, and the whole dish accompanied by the rice which was perfect. My friend had the 'real' Angry bird and the curry is drier and more spicy. 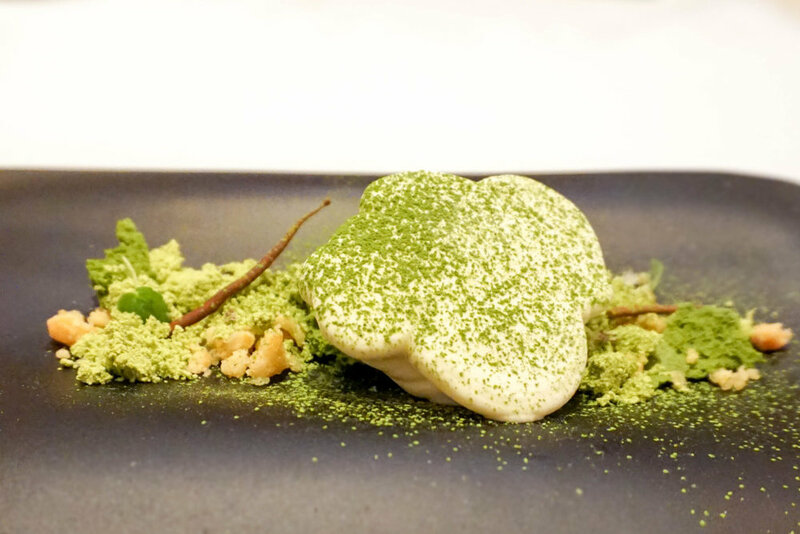 The dessert was matcha cake with mascarpone cream, vanilla salt and fresh wasabi-somewhat like matcha Tiramisu. The whole dish tastes great-not oversweetend, but somewhat bitter. It was creamy and smooth, such a sweet ending. Inspired from the famous ice cream, made of their homemade chocolate with white chocolate filling, and some popping candies outside. The texture was interesting and reminds us of our childhood. The dining experience at Gaggan was quite impressive, one of the best restaurants i visited during this trip. To its position of Asia's third, we both think it is more qualified than Nahm, no matter regarding to the food, service or ambiance. I love indian food and this was my first molecule Indian experience- it was memorable. Next time i would like to try other menus!